MTC has achieved Gold Certified Partner level in the Microsoft Partner Program. 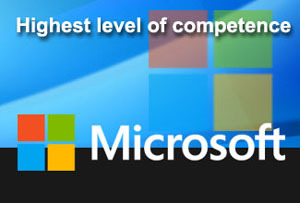 According to Microsoft, there are only 5,000 Gold Certified Partners out of a total of 775,000 partners worldwide. MTC represents the highest level of competence and expertise with Microsoft technologies, and have the closest working relationship with Microsoft to serve customers. MTC will provide best customer services and solutions, and create business relationships with other MTC partners whose skills and expertise complement and help to increase customer satisfaction. Capture your ideas however you work best—with keyboard, pen, or touchscreen. View Word documents in the new Read mode for a pleasant and focused reading experience on large or small screens. Capture and organize all kinds of information in OneNote—notes, pictures, web pages, voice memos, even videos—and share it virtually anywhere. Easily work with others on your shared documents with free Office Web Apps. Present a Word document on your screen to others using only a browser with the Present Online feature, even if they don't have Word installed. Easily incorporate content from PDFs into your Word documents. Use Recommended Charts to visualize your Excel data and draw conclusions in less time.